Following another members recent report of the Lost Password form not displaying the captcha verification code (HERE) thus preventing a password reset being done, this has now been fixed so any members who have forgotten or forget their password can now successfully initiate the password reset process. I believe this got broken following the server rebuild last November following the hacker attack we became a victim of. 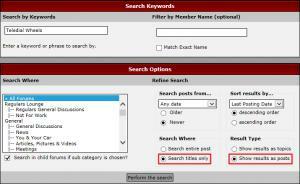 While were on this subject, do you know why the search function doesnt work properly? I can only search one word questions, as soon as I put in 2 words or more it comes back with a board error. If I select any other combination of words or options I get results returned with no error. I've now fixed the above error but I'm not sure if it's the same error as you're getting. Can you give me an example of what keywords / member name / options you're selecting so I can try and reproduce the same error.